Did you know that our pure imported Belgian chocolate is healthy for you? Have a look at the numbers below and start enjoying a piece or more every day…. guilt-free! What is a cocoa bean? The cocoa bean is the “fruit” of the cocoa tree. Cocoa powder and cocoa butter are extracted from this bean through a very complex process. Cocoa powder and cocoa butter, complemented with sugar (and milk) are the ONLY ingredients of pure Belgian chocolate. What is dark chocolate? Dark chocolate contains no less than 45% cocoa powder and a maximum of 55% sugar. What is milk chocolate? Milk chocolate contains no less than 25% cocoa powder, maximum 55% sugar and is complemented with milk. What is white chocolate? White chocolate contains no less than 20% cocoa butter and is complemented with sugar and milk. Truffles are usually flavoured with coffee, tea, vanilla, natural fruit extracts or fine liqueurs. Often working in conjunction with vitamins, minerals are indispensable to healthy physical functioning. 25 – 35% Only found in milk and dark chocolate – involved in the maintenance of a strong skeletal system. – has a role in the utilization of energy arising from food. 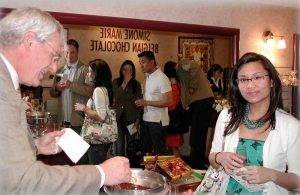 Our Chocolate and Wine (optional) tasting sessions are the perfect event to finish up a business team meeting or to celebrate a friend’s birthday. All our sessions are organized on-site and are tailored to our clients’ specific requirements for content, timing and duration. 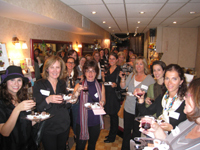 Chocolate and wine tasting events are ideal to be included in an employee recognition day or a client appreciation night. An informative chocolate presentation, by Simone Marie, guides the participants through the MAGIC of chocolate and answer their most typical questions: WHY …? HOW …? WHAT IS Authentic Belgian Chocolate? Call Simone Marie at 416-968-7777 to learn more or to get a quote for a larger number of participants or to organize a session in another city (Ontario only).